FILE - Rep. Earl Blumenauer, D-Ore., speaks in Portland, Oregon, Nov. 6, 2018. The White House and business groups are stepping up efforts to win congressional approval for the U.S.-Mexico-Canada trade accord. President Donald Trump and House Republicans stepped up their efforts to win congressional approval for the U.S.-Mexico-Canada trade accord on Tuesday, selling the plan as offering big benefits for American workers. But prospects remain uncertain as Democrats are in no hurry to secure a political victory for the president. FILE PHOTO: U.S. Trade Representative Robert Lighthizer testifies at a House Ways and Means Committee on U.S.-China trade in Washington, Feb. 27, 2019. 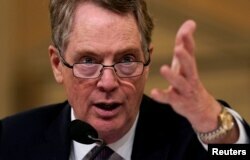 Trump's top trade negotiator, Robert Lighthizer, told lawmakers during a recent congressional hearing that if they don't pass the trade agreement, the United States will have “no credibility at all” with future trading partners, including China. “There is no trade program in the United States if we don't pass USMCA. There just isn't one,” Lighthizer said. “I don't think anyone wants to blow it up, but there is interest in strengthening it,” Blumenauer said. Rep. Vern Buchanan of Florida, the ranking Republican on the trade subcommittee, said he believes the vast majority of Republicans will end up voting for the agreement. He's tried to assure Democratic colleagues that Republicans were “open-minded to try and get some things done” to address their concerns. 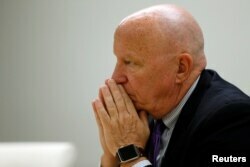 U.S. Representative Kevin Brady, R-Texas, chairman of the House Ways and Means Committee, sits for an interview about upcoming tax legislation proposals with Reuters journalists in Washington, July 19, 2017.